During the Apollo years, NASA basically made up spaceflight as it went along. Nobody was really sure what would happen to spacecraft and astronauts in the cold embrace of space. So, before exposing these multi-million dollar investments into real space, NASA subjected them to the same harsh climates — except, in Houston. NASA completed construction of the Space Environment Simulation Lab (SESL) at the Lyndon B. Johnson Space Center in Houston, Texas in 1965. Designed to perform thermal-vacuum testing for all US manned spacecraft, the facility is split into two humongous test chambers — designated A and B. 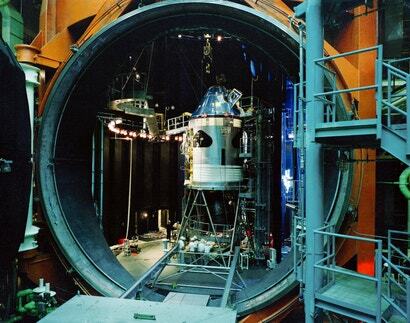 Chamber A, a 27m tall, 17m diameter silo, tests all flight hardware and components — every piece of equipment from the Apollo era spent some time in there, as well as spacesuits, Skylab's telescope system, various parts of the Shuttle fleet and numerous satellites. Chamber B performs astronaut training and studied spacecrafts' environmental control systems (read: life support). The SESL does this by literally and accurately recreating the conditions of space on Earth. Chamber A's powerful fan system can evacuate enough atmosphere from the room to simulate an altitude of more than 209km above the Earth, while its interior walls can cool themselves to -173C, recreating space's icy grip, and a pair of carbon arc module banks replicate unfiltered solar light, radiation output and heat of the sun. 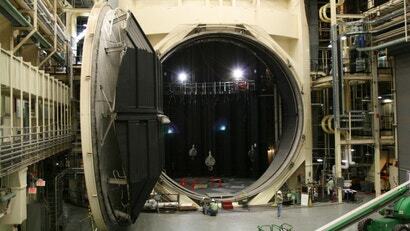 In addition, the chamber features a rotating floor and dual man-locks, pressurised rooms that act as a buffer between the test facility and the atmosphere-free chamber interior. During testing, emergency crews are stationed in these man-locks to provide immediate assistance and, if necessary, instant repressurisation of the chamber. They also double as independent altitude test stations — miniature versions of the chamber itself. Chamber B, on the other hand, is slightly smaller and lacks the moving floor, however, its smaller size makes it better suited for cheaper, faster, smaller-scale tests.